The story is about two women I knew in the town of Potchefstroom in the early 1950;s. The story is a beautiful Cinderella romance during the period of Prime Minister Hendrik Verwoerd's apartheid policies. Looking at cape Town and Potchefstroom. Potchefstroom High School for Boys. Table Mountain with a ship approaching the harbour. City Center Cape Town in the 1960's. The Church in Potchefstroom where Marie was married. Cape Town, the town Emily Kleintjies was born in, and loved. It broke her heart when she learned as a teenager, that she was classified as a second class citizen by the Government. At the young age of 16 years old, she decided to escape to Johannesburg, and make a life for herself as a WHITE, with the name of Emma Kline. The small Church on King Edward Street Potchefstroom, later renamed Kerk Street, was the church that Marie Stuart married in. The Kings Hotel c/r Potgieter Street and King Edward Street is the Hotel Emma always stayed in. This is an intriguing book that starts in pre war South Africa with a young girl challenging the racial divide and bravely stepping across to live as a White, virtually abandoning her coloured family in the process. Emily becomes Emma and adopts English as her first language, dresses and styles herself to deny her origins. This is the beginning of her awakening to injustice and her reaction to the prevailing culture and political system of her country which denies her basic opportunities. Encounters with others who have survived and overcome similar prejudice in other countries encourage and help her to carve herself a new place for in South African society and to get and hold down a challenging job. At the same time political awareness begins to emerge and she faces a major dilemma when asked for her hand in marriage by a white man. The way the story is told eases one into South Africa’s politics subtly whilst bringing Emma to life as a vivid and interesting character. As the reader, her dilemmas and fears become yours and the continual twists of the story produce an exciting sequence of colourful and interesting surprises,, much like the eponymous vase filled with many coloured marbles. The vase itself does not appear until well into the story, but from then on it keeps reappearing with a subtle underlying relevance all the way through to the end. What begins as the story of a young girl crossing the racial divide soon becomes much more, giving intimate insights into different aspects of South African society. Each of these has its own pressures and strains, its own strengths and prejudices, all of which are brought into the spotlight through the situations Emma and her growing daughter encounter. Spanning two generations, this book is almost a family saga, but without the long winded tracts such books normally involve. The second section picks up the story of Marla, Emma’s daughter, following her emergence from schoolgirl to university student and onwards. Against the backdrop of South Africa’s most turbulent years, when apartheid was in the ascendancy, witnessing the Sharpville shootings and the emergence of new political organisations, we see a young woman awakening to injustice in her country and developing a political conscience of her own as she begins to discover herself as a person. Marla’s subsequent trip to England produces a new and intriguing twist to the story with an interesting preamble about her lifelong friend Josh, who had preceded her to London and now acts as host and guide for Marla and her girlfriends. The story soon turns to a tale of love when Marla literally bumps into Bertie, who becomes instantly besotted with her. His subsequent pursuit when Marla returns to South Africa thinking he was not interested is neatly contrived and, like the rest of this book, full of interesting twists and side stories that add colour and complexity to the tale. Inevitably the truth of Emma’s and Marla’s origins has to come out at some stage and this begins on the dockside where Emma is awaiting her daughter’s arrival. As unaware of recent events in Marla’s life as her daughter is of her mother’s past, Emily is horrified to encounter her brother Jonas. Having become somewhat estranged from her family, she has no knowledge that he works in the Cape Town docks. He tells her that their mother is dying and wants to see her. Slowly the truth emerges and, after a visit to see her dying mother, Emma confesses to Marla, terrified of how she might react. Bertie, well bred gentleman that he is, takes it all in his stride and still besotted, carries things off with perfect equanimity, as do his upper crust family who come out for the wedding. To write any story involving the inter racial conflicts of South Africa would be difficult territory, but Jacob Singer has managed to contrive a very believable and charming story and to tell it in a way that keeps the reader gripped throughout. Whilst expressing no overt political bias himself, he puts a clear spotlight on injustice whilst showing up the Macchiavellian workings of the state which fosters and exploits it. At the same time he reveals with subtlety the counter currents working below the surface to correct the injustice wherever opportunity arises. An outsider with no knowledge of South African history or politics will find this book informative, disturbing and yet redemptive, whilst being entertained by a good story well told. Singer’s understanding of the racial problems and also of other forms of prejudice is deep and his compassion comes through clearly. The title, which seemed at the beginning to be rather irrelevant, becomes a beacon which endures to the end of the book. It symbolises so well the many facets, colours and contrasts of a nation actively evolving and struggling with the process as it does so. The Vase With The Many Coloured Marbles is a very good book that deserves to be widely read. Sep 27, 2011 - Outskirts Press, Inc. has published The Vase with the Many Coloured Marbles: Book 1, Emma, Book 2, Marla by Jacob Singer. The author's most recent book to date is a 6 x 9 paperback white in the Republic of South Africa history category and is available worldwide on book retailer websites such as Amazon and Barnes & Noble. The webpage at www.outskirtspress.com/vasemanycolours was launched simultaneously with the book's publication. The name of Nelson Mandela is familiar to many as a warrior against the injustices of apartheid, but many South Africans also worked to break the power of the Verwoerd regime: the Black ANC and PAC, but also English and Afrikaans-speaking whites. In The Vase with the Many Coloured Marbles, Jacob Singer draws on his personal knowledge and experience to reach out to all South Africans, especially those who left the country because of violence and who live in exile all over the world. Jacob tells the stories of men and women who were harassed and discriminated against and of politicians in the government who surreptitiously worked against the very regime that had employed them. Readers will discover unsung heroes such as Emily Kleintjies, who crossed the apartheid barrier and established a life for herself as a white woman. One doesn’t have to be South African or a student of history to learn from this remarkable book, which shares a wealth of unique experience. Everyone who is concerned with justice and the human condition will be fascinated and enlightened by the tragedies and triumphs shared in Jacob Singer’s words. 353 pages in length, The Vase with the Many Coloured Marbles: Book 1, Emma, Book 2, Marla is being aggressively promoted to appropriate markets with a focus on the Republic of South Africa history category. With U.S. wholesale distribution through Ingram and Baker & Taylor, and pervasive online availability through Amazon, Barnes & Noble and elsewhere, The Vase with the Many Coloured Marbles meets consumer demand through both retail and library markets with a suggested retail price of $21.95. Additionally, The Vase with the Many Coloured Marbles can be ordered by retailers or wholesalers for the maximum trade discount price set by the author in quantities of ten or more from the Outskirts Press Direct bookstore at www.outskirtspress.com/bookstore. For more information or to contact the author, visit www.outskirtspress.com/vasemanycolours. Jacob Asher Singer was born in 1935 near Johannesburg, in South Africa. After attending the Potchefstroom High School for Boys, he studied pharmacy at Chelsea Polytechnic in London, England. He was a practicing pharmacist in Potchefstroom for the next twenty-five years. Although Jacob was not politically active, he met and knew many active players on both sides of the political fence. When he was threatened by the security police for withholding information, he encouraged his children to emigrate, and once they had established themselves, he and his wife, Evelyn, joined them in 1992. His first book, Brakenstroom, is a book of short stories about life in Potchefstroom. 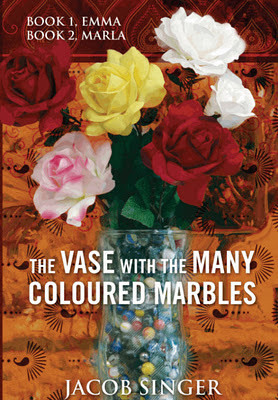 The VASE with the Many Coloured Marbles is my second book, about a family I knew as a child. My first book, Brakenstroom. Gods house are my thoughts.